In first grade students begin with formal instruction. Because the development of a secure mother tongue is a vital part of the curriculum and a prerequisite for learning a partner language, English mother tongue and German mother tongue instruction takes place daily starting in first grade. First and second grades receive 10 hours of mother tongue instruction per week, and there is no formal instruction in the partner tongue. Students are introduced to their partner language informally through an integrated program, which incorporates singing and other group activities, and the homeroom teachers responsible for teaching math, social studies and art instruct in both languages. Library skills are taught as an integrated part of the language program and during special library hours starting in second grade. Students in first and second grade have two hours of physical education per week taught by a P.E. teacher. Classroom celebrations such as Halloween, Thanksgiving, St. Nikolaus Day, and Fasching (Carnival) acquaint the students with the customs and traditions of the partner nations. Other celebrations throughout the school year help students become aware of different cultures and belief systems. 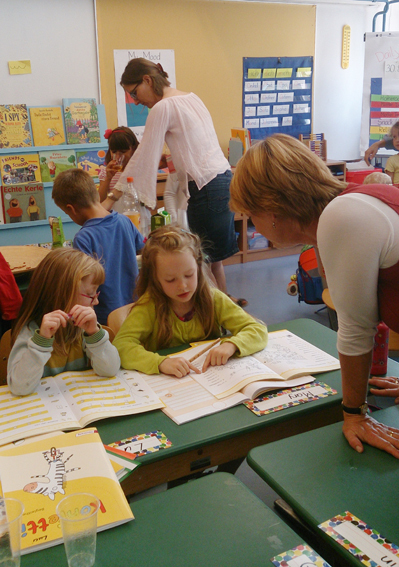 Religion of different denominations and World Views (Lebenskunde) classes in both German and English are offered on a voluntary basis starting in first grade; they are taught twice a week and are integrated into the regular weekly schedule. Field trips provide students with first-hand experience in getting to know Berlin. The school day for first and second grade starts at 8:05 and lasts until 13:05.